2-room apartment 58 m2 on 2 levels, on the ground floor. Renovated, tasteful furnishings: living/sleeping room with 1 double sofabed, open-hearth fireplace and satellite TV. Kitchenette (4 hot plates, oven, freezer). Upper floor: 1 double bedroom. Shower/WC. Barbecue. Panoramic view. Facilities: children's high chair. Internet (WiFi, extra). 1 pet/ dog allowed. The double sofa bed has to be paid extra locally like all the extra beds. Private outdoor area. Old, renovated, farmhouse in panoramic position. It consists of 2 apartments with independent entrance and a semidetsched annex where the owner lives. It is surrounded by vineyards and olive groves. Typicval tuscan style furniture. Wine, olive oil and grappa can be bought off the premesis. Old farmhouse I Ceneruzzi, renovated, surrounded by vineyards. 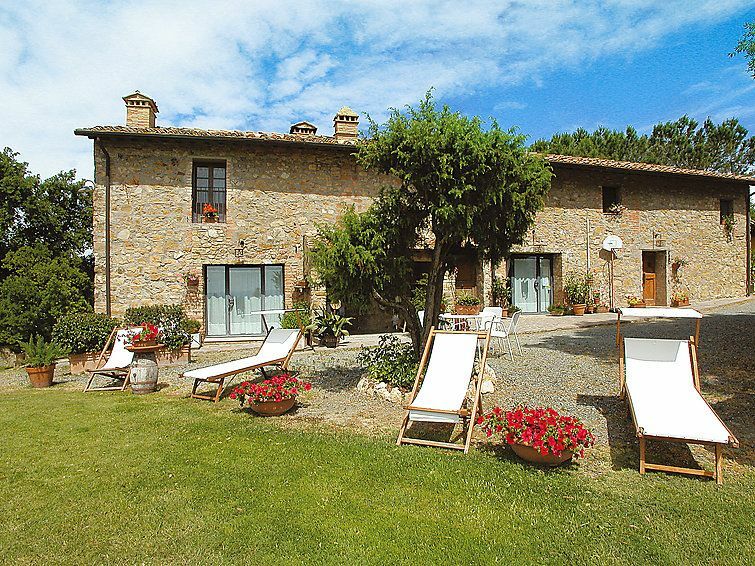 1 km from the centre of Gambassi, 12 km from the centre of San Gimignano, in a quiet position on top of a hill, in the countryside. For shared use: garden 2'000 m2 (fenced), swimming pool (5 x 9 m, depth 130 cm, 20.04.-19.10.). Table tennis, terrace, garden furniture, barbecue. In the house: with TV, central heating system. Parking at the house. Shop 1 km, railway station Certaldo/Castelfiorentino 10 km. Golf course 15 km, tennis 2 km. Please note: the owner lives on the same property.